DSM Console Server Management products help to minimize network downtime by providing IT personnel with secure, reliable Out-of-Band Rescue™ access to console port functions on remote network devices. If you're charged with the task of managing remote network equipment, then you already know how difficult it can be when a remote device locks up. In many cases, the only way to correct the problem is to travel to the network equipment rack in person, hook up a laptop to an open console port, access command mode and start looking for the source of the problem. WTI Console Server Management products provide the perfect tool for secure, remote access to console port functions on network devices ... without a long road trip to a remote equipment site. Install a WTI Console Server Manager in your equipment rack, and in many cases, you can have network problems fixed before your users even realize that there was a problem in the first place. WTI offers a wide range of Console Server Management products to fit the needs of most remote management applications. In addition to our line of dedicated Console Server Management products, we also offer Console Access Server + Power Control Hybrid products, which provide both remote console port access and remote control of power switching and reboot functions. Port connections are initiated by issuing commands via SSH or Telnet sessions; serial ports on WTI Console Server Management products can be specified by port number, port name or port group. 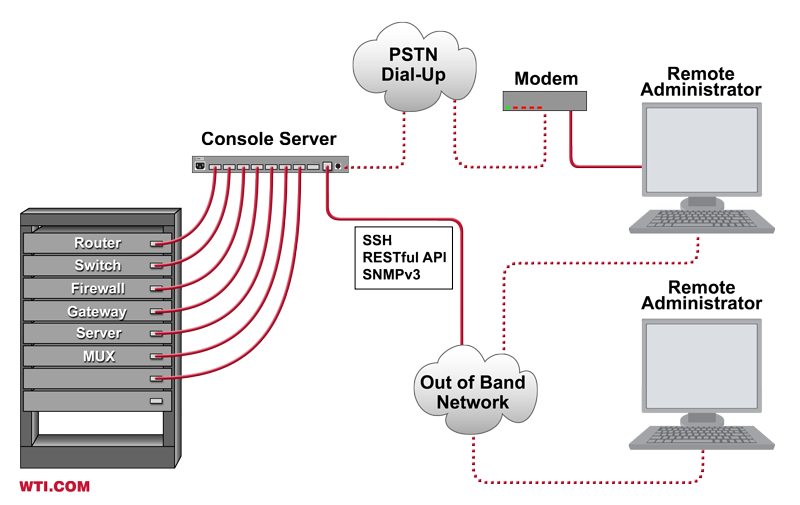 In addition, direct connections can also be initiated using TCP port assignments. Each Console Server Management serial port can be individually configured to set unique data rates, flow control and other parameters. 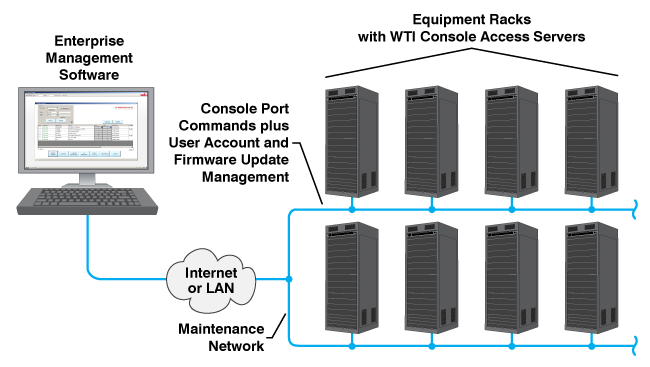 WTI Console Server Management products offer full matrix capability to allow any two ports on the switch to be easily connected, regardless of whether or not communication settings of the two ports match. Buffer Mode allows each serial port on the Console Server Management unit to record incoming data from a connected network device. Error messages, status messages and other information can be easily captured and stored for future analysis. This preserves the most recently received data from each connected device, and can often prove extremely helpful when network administrators need to determine what may have lead up to a crash when a connected device malfunctions. Captured data and messages can be stored in the Console Server Management unit's buffers, and sent to a remote location via SYSLOG, or an SNMP Trap can be generated to alert administrators when new messages are received. The Console Server Management unit can constantly monitor rack temperature, and then generate an alarm when temperatures rise above or fall below user-defined threshold values. When a high or low temperature alarm is generated, network administrators can be quickly notified via SNMP trap, SYSLOG message, email or text message. Later, if temperatures fall or rise to acceptable levels, the console server management unit can also be configured to send "all clear" notification to inform administrators that the temperature has stabilized. WTI Console Server Management units include a sophisticated, multi-level user account directory, which simplifies the process of adding and removing authorized users and setting port and command access rights. The user account directory allows administrators to custom tailor access rights for each individual user; users can be assigned to one of four pre-defined command access levels, access to specific ports can be easily enabled or denied, service access rights can be set to deny or allow outbound SSH/Telnet access and other factors and dialback security parameters can be set for users who will access the console server management unit via dial-up modem. In order to check the “health” of various network elements, the Console Server Management unit can ping one or more network devices at user-defined intervals. If a device fails to respond to a ping command, the Console Server Management unit can then generate an alarm to notify administrators that a network element might be on the brink of malfunctioning. This enables network managers to keep better track of important network devices and allows administrators to investigate unresponsive network elements quickly, instead of waiting for users to complain when a service or capability suddenly ceases to function. Configuration of the ping response alarm is extremely flexible; a simple, user-friendly menu system is employed to select ping intervals, the number of failed responses required to generate an alarm, the type of alarm action that will be performed and many other parameters, including the option to notify up to three users when an alarm is generated. WTI Console Server Management units support a variety of authentication protocols that allow the unit to verify the identity of each user account before users are allowed to access command and configuration functions. The presence of multiple authentication protocols provides WTI Console Server Management units with a degree of flexibility that allows adaptation to a wider variety of diverse applications. Support for LDAP, Kerberos, RADIUS and TACACS+ enables a WTI Console Server Management unit to fit the requirements of almost any authentication application imaginable. In order to adapt to the needs of different types of users and administrators, WTI Console Server Management products include three different control interfaces: a text (CLI) interface, a web browser based interface and an interface designed for access via PDA. The text interface (or command line interface) allows users and administrators to invoke simple ASCII commands to select parameters and establish port connections. The Web Browser Interface is intended primarily for configuration and status display, and includes a series of user-friendly web based menus that are used to select configuration parameters and display status information. The PDA Interface provides PDA users with easy, remote access to unit status and port status display functions. WTI Console Server Management units feature three handy data logging functions that can be employed to record alarm events, user activity and temperature history. When the Audit Log feature is enabled, the Console Server Management unit will record user command activity such as login and logout times and dates, port connection and configuration changes. The Alarm Log feature can be used to record the time, date and triggering event each time that a user-defined event alarm or environmental alarm is generated. When the Temperature Log feature is enabled, the Console Server Management unit will log all temperature readings, including the time and date of each reading. This essentially creates a temperature history log that can either be viewed as straight ASCII data, or displayed in graph format when the Temperature Log is viewed via the Web Browser interface. In order to prepare for the upcoming switchover to IPv6 protocol, all WTI Console Server Management Units now provide full support for both IPv4 and IPv6 (the intended successor to IPv4.) This helps to ensure that WTI Console SErver Management Units purchased today will be fully compatible with the planned IPv6 internet environment, and will not be rendered obsolete when the IPv6 protocol eventually becomes the new worldwide standard for network communications. All WTI console server management products include WTI’s convenient Enterprise Management Software, which drastically simplifies the task of managing multiple console server management units spread throughout your network infrastructure. The WMU Enterprise Management Software provides a centralized command interface that allows administrators to easily manage, label and control multiple WTI console server management units in large network applications, reducing the time required to access console port command functions on connected devices. Once installed on your PC or laptop, the Enterprise Management Software can search a user-defined IP address range on your network and discover all compatible WTI devices within the range. Discovered devices are then added to the Enterprise Management Software’s inventory, allowing administrators to assign a descriptive tag to each console server management unit in order to denote the location or function of the device. In addition to providing a centralized interface for remote console access functions, the Enterprise Management Software can also be used to control firmware updates for WTI products and edit and manage user accounts at individual or multiple WTI devices. * All company and product names or logos mentioned herein are trademarks of their respective companies. © 1996-2019. WTI- Western Telematic, Inc.